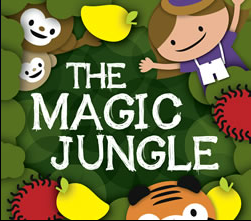 We went to watch Esplanade Play Time’s other offering, The Magic Ocean a while back and decided that since we loved that, we would go catch their other offering The Magic Jungle when it came round and I am so glad we decided to do so. This show is designed for pre-school kids and the show- with their fairly simple humor, music and antics was a big hit with my 2.5yo and the rest of the same-age bracket crowd. There were several older kids who seemed a little bored after a while but the rest of the audience- and the accompanying parents, thoroughly enjoy it. Q even left the theatre singing and mimicking what he saw. The jungle is full of animals that come out to play when the sun goes down. Can you see the cockatoos, the sloth bear, the flying fox and the gibbons? Can you help the tiger and the leopard to find their stripes and spots? Glide, stomp, swing and jump through the Magic Jungle with Paige!